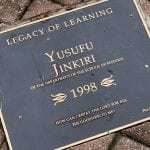 Yusufu Jinkiri, Assistant Professor of Business Administration, celebrated 20 years of teaching at Belhaven University and recently joined the university’s Legacy of Learning. Yusufu was born and raised in Nigeria to Muslim parents, but became a Christian at an early age. 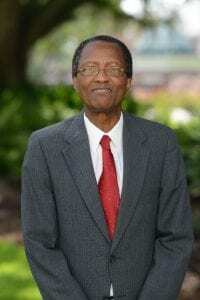 He attended Ahmadu Bello University in Nigeria where he received an undergraduate degree in Economics, before coming to the United States to pursue a Ph.D. from the University of Connecticut. After going back and receiving a Master’s degree in theology from Wheaton College, Yusufu heard of Belhaven from Dr. Chip Mason. “When I first arrived on campus, Bettye Quinn warmly welcomed me. She gave me a book and a card that made a positive and lasting impression on me, added Yusufu. Since coming to Belhaven, Yusufu has taught a wide variety of courses in the business school. But the campus has changed greatly since he first joined the faculty in 1998. Even after 20 years of teaching, Yusufu continues to be encouraged daily by his students.